Our wax melter is based on Paul Magnuson's design (above). I generally process beeswax in two stages. The first, in the solar wax melter, is a wet phase, and the second and any subsequent meltings are done dry, without water. Sometimes I find the wax is tacky, and I have trouble getting it out of my molds. This tends to happen with older comb, or wax rendered from brood combs. Either the propolis and other impurities are the problem, or the wax may be partially saponified. 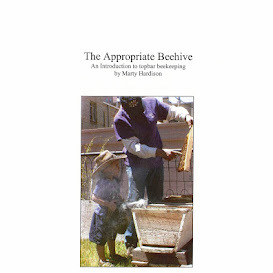 According to Dave Cushman, to avoid saponification of the beeswax in the wet phase, the water should be acidified with lemon juice, lime juice or vinegar (one or two teaspoons per pint of water). When I have enough wax accumulated, I'll melt some with and without acidifying the water and will post on the differences.